Ever since we set up my childhood bed in our guest room after our move, Katie has been fairly vocal about wanting it for her own. I promised her several months ago that, when the time came for her to have her "big girl bed," I would give her my bed if she still wanted it. Knowing now that Eric is on his way, she has been eager to give him her crib (which she has never been too fond of, I must say) and to have her big girl bed. Amie surprised me when she came over this afternoon: Amie suggested we switch the crib and bed and move around Katie's furniture. I have been wanting to do this, and Katie and I were both excited. When Katie realized she was getting her bed today, she jumped up and down and started singing. 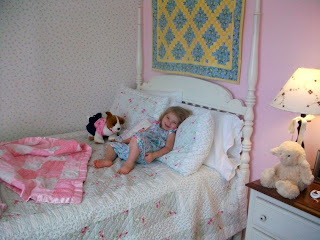 Happy Katie is elated to have her big girl bed. We moved the bookshelf and her chair to this side of the room. We had to put her tall dresser in the closet (it is still functional in there). My mom had the idea to put the chair in the corner (I had the chair and the bookcase switched originally), and I think her arrangement is super cozy! Here is a view of Katie's short dresser (also my childhood furniture). We moved all of the changing-table items from it (I have been asking Katie about that since we're using underpants more and more now, but she has been hesitant to get rid of the changing pad---so we took the opportunity to do it today as part of the overall change). Now she has her jewelry there and some other keepsakes. Katie loves her new bed so much that she wanted to read and snuggle in it right after bathtime tonight. She is snoozing there right now as I write. It seems pretty cozy to me!